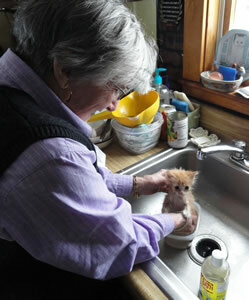 Volunteer Anne Price gives Marmalade a bath. Marmalade was a throw away kitten. Hard to believe when you look at that face. Volunteers at HHPR did not know if he would survive. But as we have seen before, a bit of care and lots of love works miracles. This little fella wasted no time stealing hearts once he found his way to Halfway Home. Little Marmalade quickly gained the nickname “Marble” because his belly was so enlarged he was like a marble with legs. He was far behind in his weight and growth rate which concerned us all about underlying medical conditions. But, his medical tests proved this mini-kitty was a survivor! His digestive system was just a bit underdeveloped and all he needed was time. This was something we could arrange. 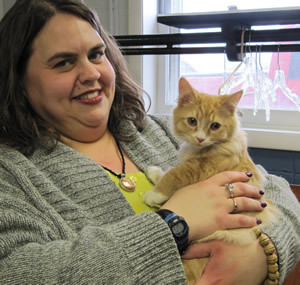 Marmalade was given the usual TLC from volunteers and then appeared his foster mom, Stacey – love at first sight – big surprise. 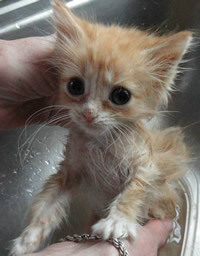 Marmalade’s progress was a certainty once he was in his foster home. Of course, the foster home became his permanent home.